Got together with James and Mike to tackle a project I had been looking into for awhile now; Replacing the radiator, waterpump and thermostat. Now, I did plenty of prep work. I got copies of the service manual from the dealership, I looked up various DIYs, but we still ran into some parts that took us longer than expected. Regardless, the install was a great turn out. 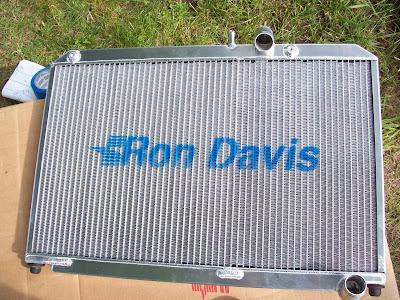 I had purchased the Ron Davis radiator, their colder thermostat (170 degrees I believe) and their high flow water pump (boy what a huge difference) filled with Prestone 50/50. I won’t go into specific details like a DIY, but I will post the links I used for help and the order in which I did this. Remove the battery and battery box (Heads up: it’s split in 3 pieces. Top, then the middle is held on by clips in the back. Bottom part is then only held on by bolts. Right now is when you can see mostly everything you will be working with in the engine bay. The water pump is right under the water pump pulley, and the thermostat is just next to it. Lets move on. Now is when you want to jack up the car. We unfortunately only had 2 Jacks for the front, but it’s ideal to have 4 to keep the car level while lifted up for this process. Look up. You’ll see the radiator sandwiched between the AC condenser and the fans. Try and make note of anything that is connected to the radiator, such as bolts, radiator tubes, and anything else that may possibly be in your way. The goal is to slide the radiator down as smoothly and easily as possible. Look for the drain plug for the radiator, get your pan (make sure you have a big one because we overfilled ours, and it was a huge pan!) and start draining. Once done, let it sit for a few minutes to try and let as much as possible drip out. From here, we did the easy top two parts such as thermostat and waterpump just to get it out of the way. It seemed like the easy and quick approach. 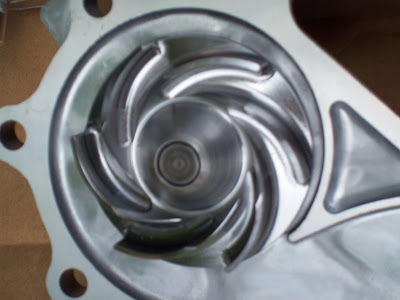 Unbolt the waterpump, replace with your new one. Tighten just enough for now. Thermostat is tricky as you’ll need someone to tug on the long metal pole that we think is the EGR, though we’re not 100% (forgive me on that, but I’m not all knowing!). Remove the tubes to the thermostat, unbolt, then while someone holds back on the EGR, twist the top of the thermostat and then pull up. There you will see the thermostat in it’s case. Replace that with your new one, and place everything back. Have lunch. Food is essential and by now you must be eye balling the radiator wondering why it’s going to be the hardest install. It’s not, just tricky…but eat first so you have the patience for it. 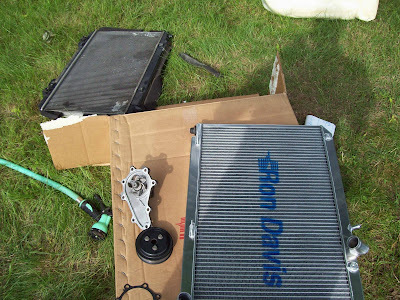 Once done, check out the stuff I had mentioned connected to the radiator. Unbolt the AC condenser from the radiator via the front, two bolts on top from the fan, and take off the tubes going to the radiator. The last would be the brackets under the car holding up the radiator. We saved this for last so we always had something holding up the radiator. 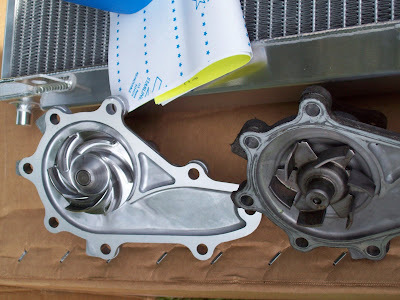 From here, have your champion of a friend tug on the fan assembly and lift up from the engine bay to get it off the radiator, while you are slowly guiding the radiator down from inbetween the two. Be sure to be careful with the AC and radiator fins, I’m sure it’s not easy to make those straight again. Replace the radiator by sliding up the new one very slowly and carefully. Be sure the tubing inlets go towards the back of the car. Place back on the under body brackets for the radiator, and then redo everything you took off! Wait on the splash shield for the very last step though. When you’re done placing everything back except the splash shield, go ahead and turn on the car (don’t start just yet). May as well do your activation of DSC, set radio and get that all out of the way. Once done, open your coolant reservoir. Start the car and let it get to a good running temperature while watching the reservoir. Should you need to add coolant, go for it, but try not to go past the full line. Once you’ve reached operating temperature, cover the reservoir and go back to the car. Turn the heat to full blast (yes the heat) and then rev the car to 3.5 or 4 RPM. Hold it for 15-20 seconds to get the coolant going through the system and then ease off the gas. Go back to the coolant reservoir and check the levels, filling if needed. After that, repeat the last step one or two more times to ensure your level is steady and enough coolant has gone through the system. Then you’re done! You may need to do this again the following day, but keep an eye on the levels regardless for awhile until you’re sure the coolant level isn’t getting lower at all. Big ups to them for the great DIYs, and big ups to James, Mike, Stephanie and Liz for the help, good company, and great BBQ lunch. As for the review of the parts, since I forgot to flush and ran home right off the bat, I noticed several heat spikes and thought I was going to lose the car. After flushing a good few times and flushing the next day, my cooling levels were excellent. In 68 Degree weather Cruising on the highway in 6th gear I was seeing temperatures as low as 175. Pushing the car in 82 Degree weather to high RPMs got me to around 190’s. When I was really running at the SCCA event we only got our highest to 208, and after opening the hood and letting it cool, it settled to low 190’s. I’m very pleased with this setup, and I can only hope that it really does help prolong the life of my car and keep my temperatures consistent and low.